Fill high-speed system for textile handling of prepregs in the limelight at the 2013 JEC Composites Show in Paris. 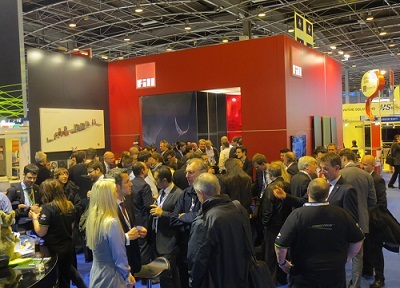 The presentation of the speedlayer 800 from Fill Machine Engineering was a great success at the 2013 JEC Composites Show from 12 to 14 March 2013 in Paris. The high-speed system is capable of laying prepregs quickly, accurately, and reproducibly. This allows a previously unsurpassed level of productivity to be achieved in textile automation. “Our exhibition stand turned into a meeting place for the industry. Partners, customers, and friends were able to see the high standard of textile handling for the production of modern composites for themselves. We are particularly pleased with the plentiful positive feedback and the number of concrete customer inquiries,” reports Wilhelm Rupertsberger, Manager of the Plastics Competence Center at Fill. Gurten, 21 March 2013 – With the speedlayer 800, Fill Machine Engineering is opening up new dimensions in terms of speed and precision in the textile handling of prepregs. This area is one of the major technical challenges facing process automation. Process reliability, efficiency, and cost-effectiveness are in demand. The speedlayer 800 allows savings of up to 80 percent to made in process times in the manufacturing of rotor blades for wind turbines – with consistent quality and reproducibility. The demonstrable product benefits, combined with the enormous increase in productivity and therefore cost-effectiveness, also predestine the speedlayer 800 for use in the automotive and aerospace industries. Concrete talks have already been held on this matter with representatives of both industries at the JEC. “We can draw on 30 years of experience in automating production sequences in the composite fiber sector and we see ourselves as a systems integrator who also plays the part of general contractor when required. This is a very convincing offering for our customers,” says Wilhelm Rupertsberger. The focus of Fill Machine Engineering lies in project management, development and production of machines, and integration of the individual components – from quality control to commissioning. In the automotive sector, the Austrian special machine builder manufactures systems for the high-volume production of CFRP structural parts for renowned German carmakers. Furthermore, Fill is also engaged in machine systems for the automation of braiding processes and in textile trimming solutions. Fill is a leading international machine and plant manufacturing company for diverse branches of industry. The family-owned business excels in the use of the latest technologies in management, communication, and production. Business operations encompass the fields of metal, plastics and wood for the automotive, aircraft, wind energy, sport and building industries The company is the global market leader in ski and snowboard production machines and aluminum core removal technology. Andreas Fill and Wolfgang Rathner are joint CEOs of the company founded in 1966 that is still completely family-owned. The company became a public limited company (GmbH) in 1987, was certified in accordance with ISO 9001 in 1997, and now has more than 570 employees.